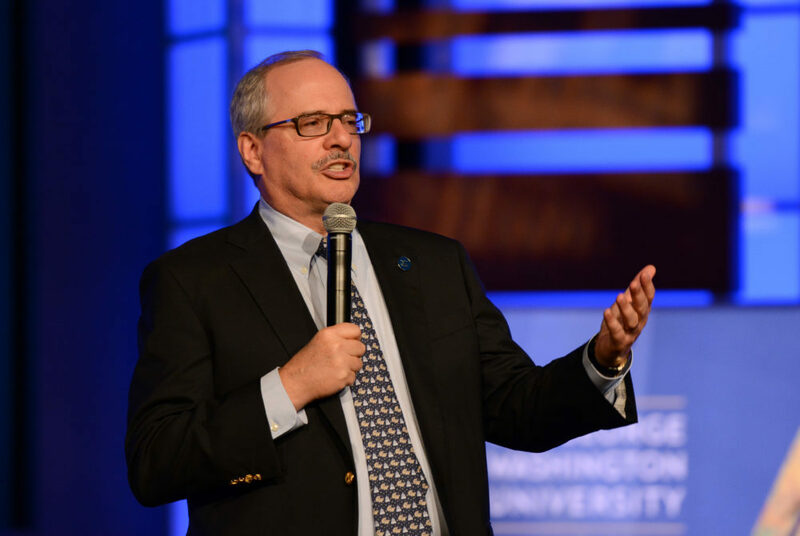 University President Thomas LeBlanc said GW will partner with the Disney Institute, a professional development company under the umbrella of the Disney corporation, this month to conduct an assessment of GW’s culture. University President Thomas LeBlanc still remembers visiting Walt Disney World with his young children, spending the day at the park and returning every night to find his sons’ stuffed animals in a new position than where they had been left. His sons, he said, would be anxious to see “what magic happened” every day while they had been enjoying their vacation. In reality, it was an employee taking an extra two minutes to clean the room – but it completely changed his family’s experience, LeBlanc said. “What is fascinating is how everything you see in what we call ‘magic’ is very intentional in their culture,” he said. It’s that culture that inspired LeBlanc to partner with the Disney Institute, a professional development company under the umbrella of the Disney corporation, this month to conduct an assessment of GW’s culture. The institute will distribute a survey to faculty and staff and conduct focus-group interviews throughout the fall semester to gauge the state of institutional culture at GW and potential areas for improvement, LeBlanc said. Staff at the Disney Institute will analyze the answers to the questions and then conduct focus groups to get more in-depth data. Officials can then either contract the Disney Institute to suggest action points to make cultural improvements, hire another company or evaluate the data themselves, LeBlanc said. Though the Disney Institute surveys are anonymous, the University will have a hand in overseeing the assessment, LeBlanc said. Mark Diaz, the executive vice president and chief financial officer, will lead a team of officials who can contribute to the institutional culture strategic initiative. LeBlanc said the team members haven’t yet been decided but will include representatives from human resources. Since arriving on campus last year, LeBlanc has said improving the culture at GW is one of his top five priorities. On the University’s strategic initiatives website, officials wrote that institutional culture “has a profound effect on the experience” of students, faculty, staff and alumni. Judy Maillet, the lead marketing strategist at the Disney Institute, declined to comment, citing a policy not to speak with the media about potential, current or past client work. LeBlanc said he previously worked with the Disney Institute while he was provost of the University of Miami to assess the culture of various departments. The University of Miami is one of few schools – and the only of GW’s peers – to feature an Office of Institutional Culture. Isaac Prilleltensky, the vice provost for institutional culture and the dean of the School of Education and Human Development at the University of Miami, said the culture office is designed to help employees feel like they have a voice and have value. He said the administration believes an inclusive culture contributes to the success of the financial, educational, research and service future of the school. Leadership and management experts said universities should perform regular surveys to ensure administrators can identify and address deep-rooted problems that employees face on a day-to-day basis. Michael Langford, a postdoctoral research associate in the Pullias Center for Higher Education at the University of Southern California, said there is increasing pressure for colleges to compete against each other, which can cause a school to be more business-like and lose the main purpose of the institution – to serve students. “There’s a lot of individuals who believe in deeply in this public good notion, but at the same time, the culture itself may seem to be at odds with that because of competition and business interests,” he said. Langford said getting constant feedback from university stakeholders makes officials more likely to find success in implementing change that will be long-lasting. If an institution can acknowledge when a tactic is not working, administrators can correct course quickly, he said. He added that issuing a culture survey could help build support for LeBlanc, who entered his second year as University president this summer – but only if the survey is conducted in a transparent manner and officials take action soon after results are released. Greg Dubrow, the director of research and policy analysis at the Office of Undergraduate Admissions at the University of California, Berkeley, said making the survey a regular occurrence could help officials track what issues are reflective of the current environment of the University versus long-term cultural issues. “You see what are the things you can change that are meaty and easy to change and what are the things that need longer-term, deeper change,” he said. Ilena Peng, Hayden Smith and Alec Rich contributed reporting.